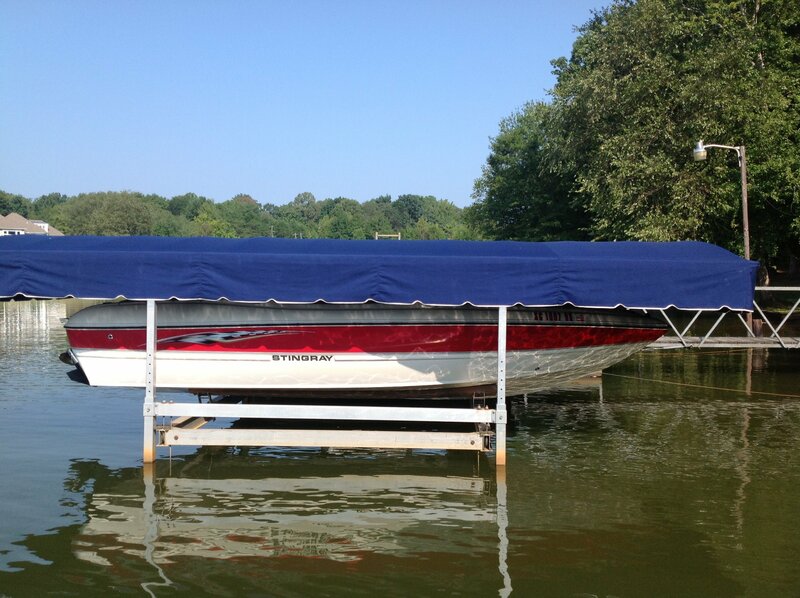 Storing your boat on a canopy lift is an excellent way to keep it protected from the elements! Whether or not you have a full boat cover on the boat under the canopy, the canvas itself will still offer your boat good UV protection and help to keep some of the rain off. 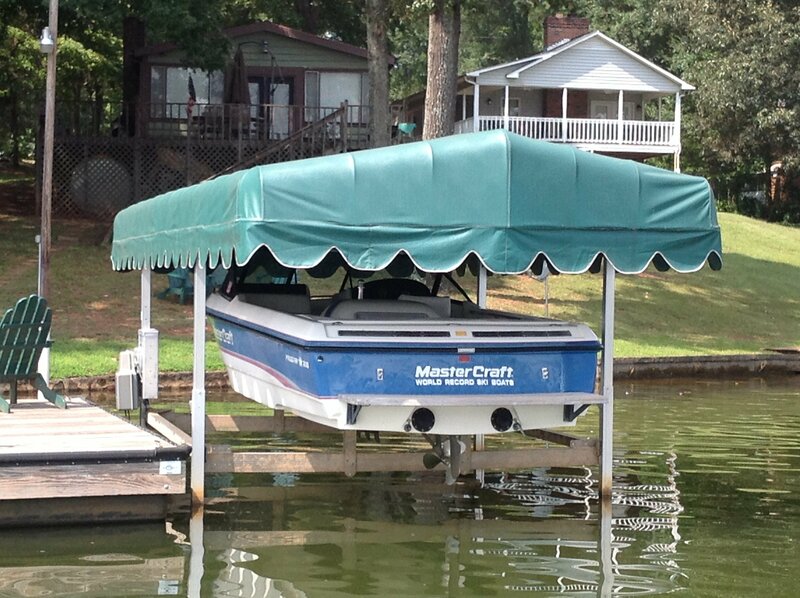 Keeping your boat protected is a tough job, so when that canopy gives up, come to us for a replacement! Our canopy lift covers are offered by Covertuff for more than a dozen frame manufacturers. Not sure who made your frame? We can help you find out. Send a photo to info@boatcoversdirect.com for help identifying the manufacturer. We have custom replacements for frames by Shorestation, Lakeshore, Triton, NuCraft, Vibo, Newman, Daka, Pier Pleasure, Shoremaster, and more! If your frame is made by another manufacturer, we can possibly still help by making a custom pattern, so email us anyway. We stand behind our products and guarantee not only their quality, but their fit as well. Your new canvas will come with the appropriate hardware to affix it to the frame, easy to follow installation instructions, and a storage bag. Installing the canopy lift cover to your frame is also made easy! You will simply unroll the fabric along the length of the frame from front to back, with the webbing on the inside. Pull the bungees through the perforated slots, and affix them to the frame, reciprocating your actions on either side so the fabric remains centered. If you run into any problems during installation, or have any questions, do not hesitate to email us or call at 1-866-626-8377. 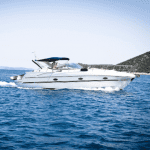 Shelter-Rite is the original option for our boat lift replacement canopies. Although this is our most economical canopy replacement cover, we consider it to be one of the best on the market. This is the most widely used material in canopy covers, and it has maintained its popularity over many years. This Vinyl cover weighs in at 18 oz per yard, and it is our heaviest material. This will make it harder to take on and off but will also help it to stay in place best when receiving high winds. It is an excellent material for both shedding water and blocking the sun’s rays. Weather-Max is the lightest option for our canopy replacement covers. It weighs 8 oz per yard, and it will be the easiest to put on and take off the frame. This material is best for ease of handling and is one of our more popular options. It will offer great protection from rain, snow, and intense sun. RecWater is the top of the line, most durable material for all weather environments. It is made from a combination of Recacril fabric and liquid vinyl with a PVC coated finish on the underside. RecWater is offered in the following beautiful colors: Linen Tweed, Black, Cadet Gray, Charcoal Tweed, Red Tweed, Green Tweed and Blue Tweed. This material weighs in at 19 oz. per yard. Looking to match your new canvas color perfectly to the scheme of your boat? We are happy to send samples in any material and color requested! Just email us your address and the colors you would like to info@boatcoversdirect.com. Ready to order your replacement canopy? Give us a call! You can get $20 off just by mentioning this blog post! Do you need something quickly? If your canopy cover is not in stock, we can get it out to you in 5 business days or less. Shipping is free, and the product comes from Fergus Falls, MN. Next: What Kind of Pontoon Boater are YOU?